A sleek viking knit chain bracelet traps a line of glittery gold sandstone beads. This bracelet is crafted with a single strand of 26 gauge sterling silver. This bracelet is roughly 1/4" wide with 4mm beads. Bracelet length: 6.5". If you need an extender, please leave your bracelet length in Notes to Seller or send a convo. Thank you. For a snug fit, add 1/4" to 1/2" to your wrist measurement. For a comfort fit, add 3/4" to 1" to your wrist measurement. For a loose fit, add 1-1/4" to your wrist measurement. Viking knitting involves working stitch by stitch around a smooth wood dowel and drawing the chain through a tool to compress it. This makes a smooth, supple chain. A chain of this length takes approximately one hour to "knit" and finish the ends. Every jewelry order ships in a small kraft gift box wrapped with a length of ribbon, ready to gift or wear on arrival. 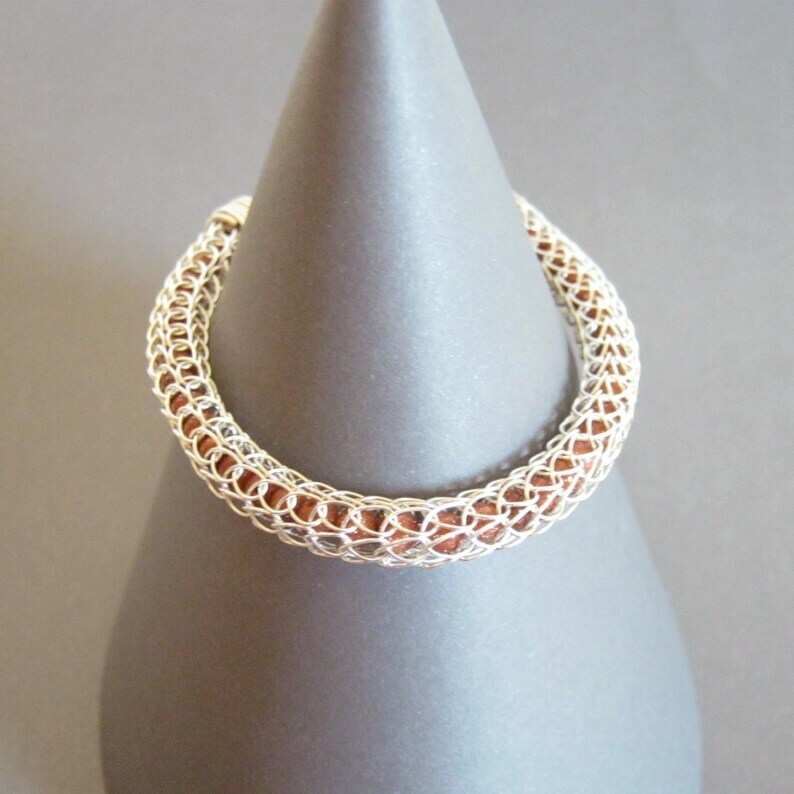 For your convenience, I supply a quarter-sized polishing cloth with each order of bare copper or sterling silver jewelry. A full-size cloth is available for $2.50.